10 Tips to Get Kids to Eat Vegetables - Even Mom RDs Struggle! Tired of begging your kids to eat their veggies? These 10 tips will help! This page contains affiliate links. See below for full disclosure statement. How many times a day do you find yourself telling your kids to eat their veggies? For most parents I know it’s more often than they’d like! Although I am a registered dietitian nutritionist, I too struggle with my girls consuming the recommended amount of vegetables per day. It wasn’t always this way. 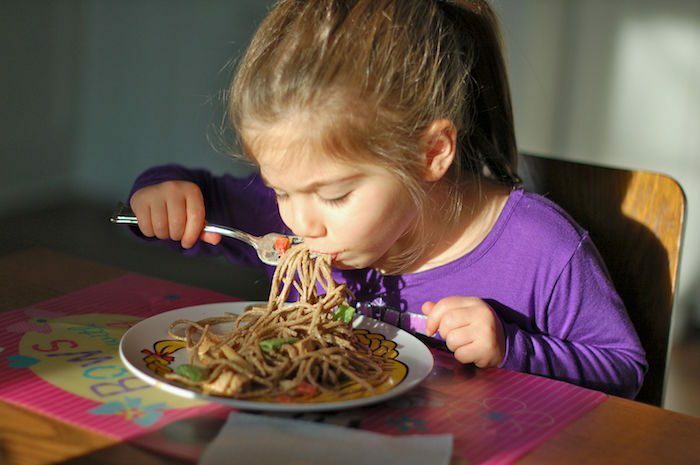 When my girls were two and three they ate pretty much anything I put in front of them – just look at them go to town on these Peanut Soba Noodles and Chipotle Beef Tacos when they were three years old! But much to my chagrin, times have changed. Peer influence and more exposure to food outside of the home have led to decreased veggie intake. Yesterday was breakfast for lunch day, which consisted of french toast made with white bread, scrambled eggs, roasted potatoes, and steamed carrots. There is also a salad bar that has lettuce, cucumbers, red and green peppers, carrots, tomatoes, tuna salad, chickpeas, blanched broccoli, and a few other items; fresh fruit; whole wheat bagels with butter, cream cheese, sun-butter, and jelly available as spreads; and a “smoothie,” which is just fruit and water pureed together. It’s not the best school lunch spread I’ve seen, but surely not the worst either. The two main things that bothered me were that the French toast wasn’t made with whole wheat bread and the syrup was not pure maple syrup (and the kids took A LOT of syrup). I could go on with my thoughts about what I saw in the lunchroom, but let’s get back to the topic of vegetable intake. I could count on one hand the number of kids who asked for the carrots at the hot food station, and my two kids were not included in that count. I didn’t take my girls by the hand to the salad bar to put a veggie on each of their trays, but we have talked about the concept of a balanced plate enough times that they know that’s what they need to do. What counts as a vegetable is still a work in progress. So when I went to their tables to say hello, one of my girls had olives as her “vegetable” and the other had carrots, which were not eaten. Needless to say, my girls did not get the recommended amount of veggies at lunch time yesterday. I’m not going to sit here and tell you what I saw in the lunchroom didn’t bother me – it did. I’m definitely frustrated by the change in their eating habits and occasionally I may push them too hard to eat what I serve. But with my RDN hat on (and remembering back to my childhood when I was a self-proclaimed selective eater who only ate peas and carrots), I know that food preferences ebb and flow and forcing certain foods (i.e., produce) and restricting preferred foods (i.e., treats) doesn’t work and can backfire. When I get down about the girls not eating something that they ate a year or two ago, I think about what my husband often reminds me: I laid the foundation for healthy eating and hopefully (and most likely) they will come back to that as they get older. That doesn’t mean I stop trying to encourage their vegetable intake; rather, I have to put more thought and effort into doing so, especially at family meals. 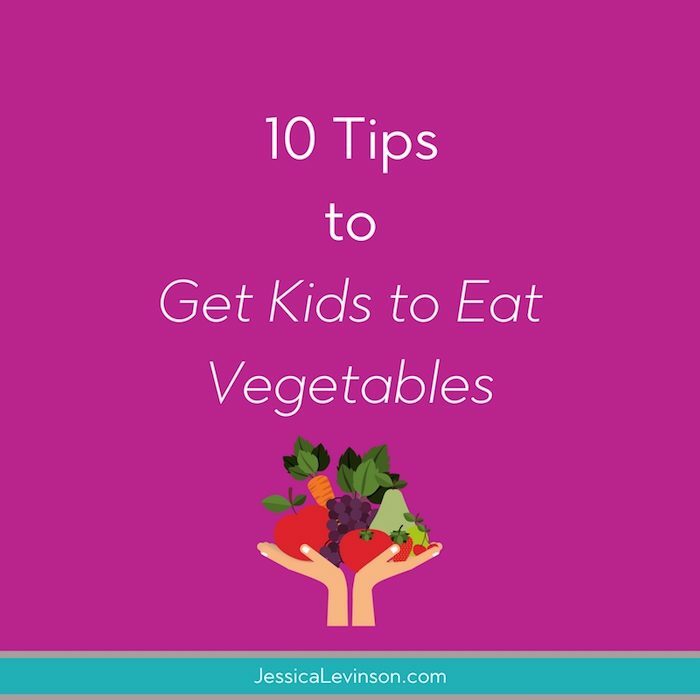 That’s where my top 10 tips to get kids to eat vegetables come in and I hope they help you too. You don’t need to put them all into effect at once – try one new tip a week or do a few of them at a time, whatever makes the most sense for you. Make a veggie of the week. Enlist help in the kitchen. Present veggies when kids are hungriest. Add veggies to well-liked dishes. Keep dinner separate from dessert. I recently shared these tips (plus more elaborate explanation of them) over at The Six O’Clock Scramble, an online family meal planning service targeted at busy moms and dads who want to put healthy meals on the table for their families each night. You know I’m a big fan of meal planning, so I highly recommend you try out The Scramble (affiliate link) if you need some more hand holding for the process. What’s your top tip to get kids to eat vegetables? Share with me in the comments below and let me know if any of these tips work for you! Disclosure: This page contains affiliate links. If you purchase products through these link, your cost will be the same but I will receive a small commission to help with operating costs of this blog. As always, all thoughts and opinions are my own and I only recommend products I truly believe in. Great tips and “real life” advice! I like how you examined this w/ both your “mom” hat & your “RDN” hat. As teenagers, my kids are decent veggie eaters which I attribute to me not pushing them when they were younger. Offering them at meals-yes! But, never forcing, and trying not to make a big deal about it, were key for me. Your girls look adorable as usual! Number 3 actually helps with my husband, too! He eats all kinds of veggies now that we cook meals together. I think the help in the kitchen is such a big one! Takes a bit of patience but can be so powerful! Definitely requires patience, and as a type A mama it’s probably the hardest thing for me, but it makes a huge difference! #7! #7! #7! Being a mom is hard enough but adding short order cook to the resume is not a task I am willing to take on. Your tip of making one family meal is such a great idea. When I do my meal planning, I always try to include at least one item that will please everyone (hopefully everything appeals to everyone) but if the kids absolutely refuse…. there is always breakfast in the morning. I won’t force anything, but I’m not making 4 different meals either. Adorable photo of the girls! Yes! I totally agree. So glad to hear you meal plan and you account for the whole family in doing so. And yes, there is always breakfast the next morning! Thanks for sharing your experience Caren! So familiar! When my adventurous eater started getting pickier and refusing veggies around age 3 it drove me crazy! And it was so easy to fall into a pattern of putting on too much pressure and getting frustrated. It took a lot of practice for me to handle mealtimes calmly. What usually works best is letting him serve himself, and making sure he’s hungry when the veggies are offered. Thanks for sharing your experience Lisa – so good for moms and dads to learn from others’ experiences. I’m glad you were able to get to a place of handling mealtimes calmly. I absolutely agree that letting the kids serve themselves helps a lot. That’s what my tip about making meals interactive is all about! These tips are great! I love the lead by example and to keep trying the best! Those are key! Thanks Kristina. Hope they help with your little guy and the one on the way! Thanks, so glad you enjoyed this post. Yes to leading by example! That is so important. Thank you for these tips! So glad you agree Rachel! Yes, cooking together really makes a difference. And so fun to hear that you all still cook together. Thanks for sharing Deborah! Wow, great tips. It’s always a struggle with kids. Love the idea of the veggie of the week. Thanks Laura! Let me know if you give the veggie of the week a try! These are great tips! I’ve definitely noticed that when my kids help with recipe planning and prepping they are more likely to enjoy eating whatever is for dinner! Thanks Emily, and so glad to hear that those tips work for you too! Great tips! I also like taking my kids to the farmer’s market to help choose the vegetables for the week. Then they help with the prep. Thanks Leslie. And yes! Taking them to the farmers market or grocery store to pick out a veggie is such a good way to get them interested and involved. This is such a great post! You have really great tips. I need to share these. Thanks so much Brandi. Hope they’re helpful for you and your friends! This is a great list, and I’m going to try every one of them – especially #4, so smart. I feel like I default to “get them fed” and miss an opportunity. My oldest is SO picky, and very fickle. He’ll like something one week, and then claim it’s gross the next. Thanks Danielle. Hope you find some tactics here that work for you. It’s so much easier to just give them what they want, but in the long run it pays off to work a little harder. Good luck! Great tips and awesome post! I’m going to be using these when baby comes! Glad to hear that Jessica. Definitely important for aunts and uncles to know how to best feed their nieces and nephews too! These tips + tricks are awesome…not only for children but husbands and fathers alike! I am constantly trying to hide veggies in to things and I will most definitely be putting these to use! Thanks Whitney! And Yes – I find a lot of women like to use these tips with their hubbies! Good luck. This is something I don’t have to worry about too much with the girls as they like their veggies. They also pack their lunches 99% of the time and do a good job. I can tell you that the schools here are the same way and when every once in a great while when they do have school lunch they don’t like the veggies because they aren’t fresh or they don’t taste right. 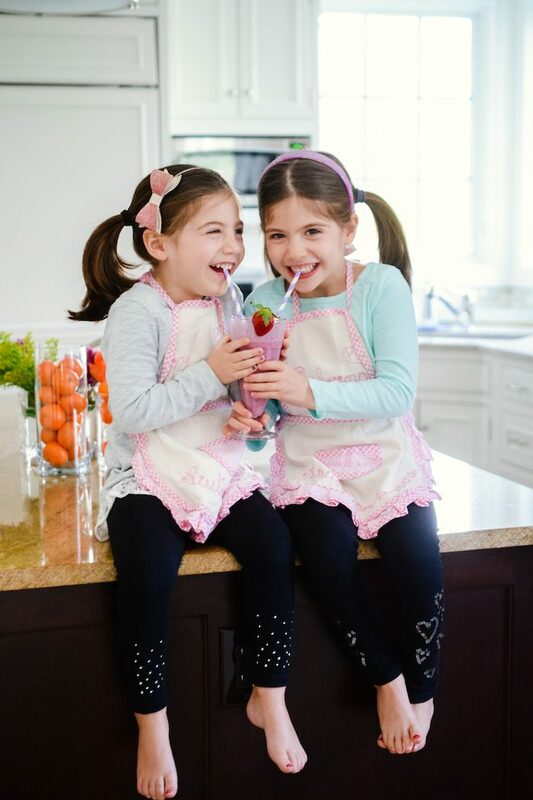 When they were younger another fun thing was to have them go grocery shopping and pick out new fruits and veggies and I always try to include them in shopping and helping in the kitchen. That’s so awesome Sarah! I hope my girls get to that point as well. Any tips you can share about how it came to be that way? Anything you think you did that helped instill the love of veggies? I love these tips! You broke it down into such manageable and realistic tips. Thanks Emily. Hope they prove helpful for you or anyone you know struggling to get kids to eat vegetables! Um, well, that’s exactly what I don’t recommend, LOL, but I guess it works for some! I am a firm believer in making only one meal for the entire family! These are all great tips, my favorite that I am going to try is making a “veggie of the week”! Yes, so important for the sanity of moms and dads and for kids to learn that they can’t have whatever they want. Hope the veggie of the week is successful for you! i dont have much experience with kids but i have found that making them part of the process, be it gardening, shopping, or preparing the meal itself really gets them excited. Yes, Dixya. Thanks for adding gardening – that’s one I forgot to mention because honestly I don’t do it myself. Hopefully one day I will have a herb and vegetable garden and my girls can help with that! Thanks Christine. Hope they are helpful when the time comes! These are fantastic tips for little ones and I’m taking notes!! Thanks Daniela! Hope they’re helpful. Great tips! I’m lucky my daughter loves veggies because it’s all she knows but we do a lot of these tips too! Her favorite right now is broccoli… insane right?! Thanks Shelby. When my girls were younger they loved almost all veggies too. How old is your daughter? I hops it doesn’t change for you! We do 1-2 veggies of the week and it really helps! Keep offering is my favorite! So important! My son has started rebelling against the veggies lately as he’s approaching 3. He used to eat anything! Luckily he’s always up for them in a smoothie and also likes salads. But I need to get a bit more creative with other dinner dishes. I feel your pain Chrissy! It’s hard when it changes like that, but amazing he likes salads and smoothies. You’re certainly setting him up with a foundation to come back to. Good luck with the dinner creativity! Good ideas! Love getting kids involved. Also planting a garden in Spring and seeing the plants grow to harvest ~ and herbs too! Thanks Carol. And yes to planting a garden! I forgot to include that since I myself don’t have a garden (yet – maybe one day). But it is always great for the kids to see how it goes from seed to food! This is probably the BEST list of eating tips I’ve seen yet…you covered nearly everything! The only one I would add that I’ve seen to also improve produce consumption, is to help kids grow their own… even if it’s just some baby lettuce in a sunny window! Excellent job here Jessica! Wow, thanks so much Catherine! So glad these tips are helpful. And I agree, growing your own is a great way to get kids excited about fruits and veggoes too! So happy to hear that Jackie! Any tips you would add?